Choosing a specific railroad and region to model can be a tough decision for model railroaders simply because so many things look good. However for me the decision of railroad and region to model was pretty easy. I knew that I did not want to model the typical green grass and green tree layout. With that decision I figured a real good choice would be to model the desert. I decided to model a freelanced former Southern Pacific line from Southern California to Southwestern Arizona. The well-known modeler of the modern Union Pacific in the desert is Pelle Soeborg. Although my current layout resembles his and it has been inspiring for me I often feel that I have to remind other model railroaders that I did not copy his layout. I planned and started building my layout months before I ever heard of him and saw his phenomenal work. His work has been featured many of times in Model Railroader magazine and I enjoy seeing it every time. I began my current layout the Southern California Desert Rail Division in late January 2004. It took me just about two weeks using graph paper to come up with a size and design I wanted to build. Although my basement is a good size at 22�x 25� I do not have that typical large basement we see very often in the MR magazine. So my original size planned for the layout was only 13�x12� because Angela demanded I leave a nice size area for storage and the washer and dryer. Within a few months the layout grew to a big part of the area without much resistance from Angie. I revised the dog bone L shape layout to add staging and a longer mainline run for the big diesels and long trains into a big square 16�x 25� area. It was Thursday February 12, 2004 that I started construction on the bench work and two days later that the original plan was built. I work very fast and it was cool because I really thought I would be running trains in that first week but I was wrong. It actually took three weeks till the entire track was down. After completing the bench work the next thing on the list was laying track of course. At first it was a small challenge simply because I had never laid flex track before and I was intimidated by cutting track. I basically used 9� straight, 22� curves and various other pieces of snap track to get a visual of the track plan. I was originally planning to use all those various pieces of track but I knew flex track would look better and allow the trains to run much smoother than using all those other pieces. Once the track was traced with a black marker for laying roadbed I bought a couple rolls of Woodland Scenics foam roadbed and used that for my layout. I used it because I heard it was so great by modelers and much easier to handle than cork. In the online forum I am an active member of there is often an ongoing debate of which is better cork or foam. There are many supporters of the foam and swear by it but just as many supporters of foam there will be just as many for the cork making it a 50/50 split. My personal preference is definitely cork over foam. In my opinion cork just muffles the sound much better than the foam stuff and it was just as easy as the foam to install. When track needed to be removed and replaced plus all my additions to the layout I have since used cork roadbed. Once I got the hang of laying flex track it was pretty easy and actually fun to do! I knew I was going to use DCC so when laying the track I would usually drop feeder lines down every 3 ft. or every section of flex track but I sometimes purposely missed a section or two and it has never resulted in a loss of power to any part of my layout. Dropping feeders down every 3 ft. as recommended by the pros is really an overkill in my opinion. The beginning of March the bench work and track was complete. To insure that I had good connections I would test it by pushing boxcars and engines with my hand over the new sections. Even though I did not have an operating system yet the time had come to pick one. Thanks to that horrible experience with the previous DC layout with polarity switching and blocks I made the decision that I was going to go with DCC for the next layout. The only choice I had to make was choosing which system was right for me. So I turned to the fellas at the forum for advice. The majority of the members used Digitrax on their personal and club layouts and all who owned it said it was a top choice system. There were a small handful of members using NCE and even members who did not own this system said it was very easy to use and one of the best. That became my top pick but the significantly higher price than any other system had me rethinking that choice. Then there was another small handful of members speaking great things of the Lenz system. Then when they explained the way to go wireless was as easy as plugging a cordless phone into the XpressNet by Lenz. I was sold to the Lenz set-100 system when I learned of that. I purchased the system with a handful of accessories including two reverse loop modules that took the polarity switching away from those switches to the automatic level! I also purchased a Lenz throttle panel to a install in a centrally location of the layout. It�s now been over two years that I have operated the Lenz system and I can honestly say I made the perfect choice for this layout. I really enjoy this system a lot. In the beginning I only owned three engines that I had to DCC equip so it was not too expensive to do so. Then when I purchased another locomotive I would also buy the correct decoder for it. The decoder installations proved to be very easy even for my first time. I have since installed all types of decoders into various engines except steam. The ones I enjoyed the most was the Athearn and Kato replacement boards but the newer models now have an 8-pin socket for easier installation. If it were not for DCC I actually believe I would not have remained in model railroading so I give thanks to that. I had big expectations of doing the scenery. I knew that it was going to be my favorite part of model railroading and building the SoCal Desert Rail Division. This was when I was able to make the visions in my head a reality and in 3-D. It was also when the spending increased dramatically. My scenery for Southern California was going to resemble what I saw in many movies since I had never been there in person. I just had the idea of yellow and light brown terrain with brushes and palm trees throughout the layout. Before I could start the terrain I had to first do the road system. I really was not looking forward to doing this project either. I didn�t have the slightest idea how most modelers did theirs. One day I was at the hobby shop and stumbled upon a container called Smooth-It by Woodland Scenics and it described how to make roads easy. I decided to give it a try so I bought it. It is a dry mix that looks very similar to Pancake mix before and after you add water. I then poured it into the designated areas for roads and parking lots and smoothed it with the piece of plastic provided from another kit for road making. I had to let it stand for about 24 hours till it was completely dry. At that point it is ready to be sanded smooth. After it is sanded it is time to paint it the color gray of my choice using a mixture of black and white acrylic paint. I also use the same black acrylic paint to dry brush down both sides of the roads to achieve the weathered appearance. I spent the next two years doing the scenery projects including building all my buildings and spreading ground foam throughout the layout. However I did not even work on the layout during the months of May to mid-October every year due to our beautiful New England summers. 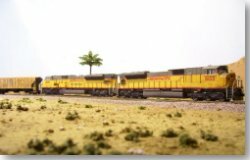 The following spring of 2005 I did a second addition to my layout by adding a 5�x6� mountain with an Air force base atop it and it looked great but since I wanted a longer mainline run I quickly removed it within a year. I separated the east end of the layout from the west and simply pushed it further over to the eastern side of basement. That addition created a good amount of room inside the layout for better navigation for more than one person. In October 2005 I knocked a wall down that was in back of the west end of my layout. It was an unused old jar room that needed to come down. That created about 5 more feet for an expansion so I removed a 4�x2� section from the west end and went all the way over to the western wall. That expansion also created a very nice longer mainline run with a passing siding track that was almost as long. These few additions to my layout turned my layout into a layout I had a vision of before I even picked up a drill and I am very pleased with the end results. The southern California Desert Rail Division is located in the desert of southern Cali to southwestern Arizona so I knew I was going to need palm trees and cactus to give the true feeling of the desert. A few regular trees were planned as well. This layout is such a nice change from the typical green layouts that most model railroaders build. I originally purchased more expensive $12 palm trees by Noch, but I later discovered more realistic looking palm tree kits sold in a three pack by Pegasus Hobbies which were almost half the price of each Noch ones. I also have a handful of cacti. You will see regular green trees throughout the layout as well but not many. This layout was built to please the railfan enthusiast inside of me. My experience with seeing live trains is standing on the side of a mainline watching a train come by not switching in a yard or industry. I take a big railfan trip with model railroad club members to Fostoria, Oh to the triple diamond and I love seeing those big diesels traveling at a high rate of speed with 100+ cars past us. That is why I chose to build a railfan style as opposed to a switching style layout. I enjoy looking at the scenery of any layout and that is hard to do when you have a big responsibility of switching in and out cars in a reasonable amount of time. For me, that is kind of boring. I really wanted to have three main themes on my layout, a small city, a mountainous region and most of importantly the hot flat desert. I was able to successfully achieve this too by building the additions! Let�s take a tour of my layout starting by traveling north on Main St. In the city you will see a lot of modern business too. Before you enter the center of town you will pass a train yard on your left and a busy engine facility across the street from the train yard on your right. Continue traveling north up to the grade crossing and you will see a few guys playing a game of basketball and across the street there is a Sprint store. After you go over the grade crossing you are in the center of Palm Springs, California. On Main St. you will see such businesses as a hobby shop, gas station, bank, liquor store and Subway restaurant located in the same building complex as the Al�s Liquor Store. As you turn off main onto West Main St. you will have an opportunity to eat at Burger King or Taco bell located right next door. You may also stop at the Loews Movie Theater to see a movie. Continue traveling west onto the Parker Bridge over the Monster River that is actually quite small. Look down at the river and see people kayaking, fishing and canoeing. Over the bridge towards the San Jacinto Mountains you will see a funeral in progress at the graveyard. Travel up the hill into the mountains you will see a beautiful scene of a loan diner and an industry right next to the mountain. Also you can see some ones home built into the mountain in the distance. The diner is the last place to eat for the next 40 miles so if you have not eaten now is the time. On the other side of the mountain you will enter into the sparsely populated desert. It is the place that is mostly flat. In the summer temperatures reach the low 100�s and it cools off during the wintertime down to the 80�s. Bring lots of water with you if you plan on traveling through here on foot. The only people you would see in this area are traveling hobos that hop trains at night and hang out drinking all day. There are not many roads in this desert area either. Traveling south you will eventually run into a big manufacturing company called the Legend Fire Supply Co. that makes pneumatic tools for fire departments around the country. Not too far from there is a small cement company called Hoffa Cement that does pretty good business through the year. Just a block away us a couple of Shell gas storage tanks. The busy scrap yard is located right next to tanks. They take trash delivered by trucks and ship it out by train. Located about a mile away is the Palm Desert County fire dept, which is a career fire dept that responds to about 1500 calls per year. When they are not busy at a call you may see a couple of them picking up dinner at the Silver Dollar diner next door. That will conclude the tour of the Southern California Desert Rail Division thanks for visiting and we hope you come back again soon.